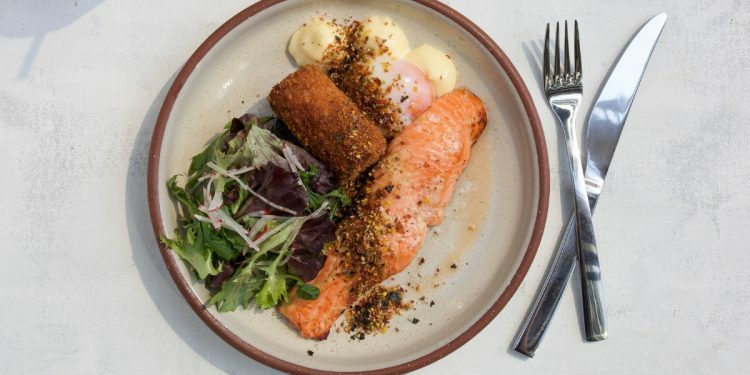 Miso Grilled King Salmon with Smoked Eel Croquette, Radish Petit Salad and Slow Cooked Egg; Devon Cafe’s Breakfast with the Sakumas can be created with ease thanks to Executive Chef, Zacharay Tan. 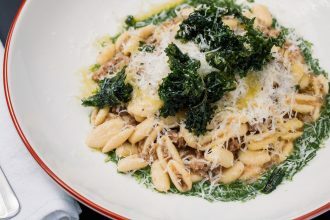 Open to the public from February 2019 in Westfield Garden City, Devon Cafe, which is originally Sydney based is now allowing Brisbanites to venture to the newest go-to venue with their all-day dining menu. From breakfast through to lunch, dinner and even a few sweets in between, Devon is proud to welcome guests in their venue that’s accentuated with light neutral hues and bleached timber creating the perfect blend of your morning pick-me-up cross a signature, fine dining approach. “We’re really excited to be opening in Queensland and being so close to great seafood, tropical fruit and vegetable farms”, says Zacharay. 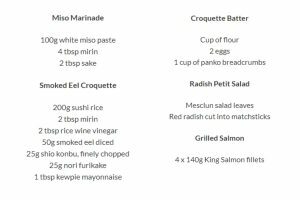 Create the miso marinade by combining the white miso paste, mirin and sake. Place the salmon fillets into the miso marinade and set aside in the fridge for 24 – 48 hours. Cook the sushi rice as per packet instructions on the stove or in a rice cooker. Fillet and debone the smoked eel, before dicing into small cubes. When the rice is cooked, season with the mirin, sake, vinegar, smoked eel, shio kombu, furikake and kewpie mayo before mixing well. Lay out some cling-wrap and spoon the rice mixture before making into a long tight roll. Set aside in the fridge to set for 20 minutes. Remove the roll from the freezer and using a knife, cut the roll into croquette size pieces and remove the wrap. Prepare in separate bowls the flour, eggs and panko breadcrumbs read for use. Crumb the croquettes by first rolling it in the flour, then egg wash followed by panko breadcrumbs. Set aside for cooking with the salmon fillets. Slice radish into matchsticks and then mix into mesclun leaf mix. Using a water bath set to 63 degrees, place a fresh large egg in and cook for an hour. If you don’t have one (highly likely), you can poach the egg by bringing the water to a boil and adding 30mL of vinegar to the water. Turn on the oven grill before taking out the salmon and place on a tray, cooking until medium-done. On a frying pan, heat up some oil and fry the croquettes, a few at a time for 3 – 4 minutes each or until crisp and golden. Place the salmon on a plate with a croquette and the salad. Dress the salad with a dash of vinaigrette before placing the warm egg on top, garnish with a dollop of kewpie mayo and sprinkle with furikake. Serves four.